Am am thinking about my next multirotor project. And as always, when I want to build something I start by drawing and experimenting in Google Sketchup. I want to build something that is different and stands out from the rest of the multirotors out there. 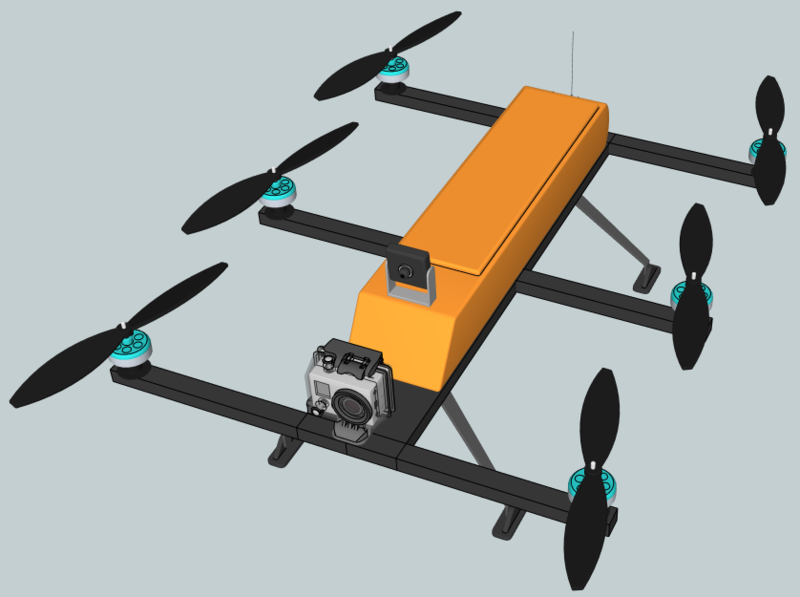 A want a steady and yet manoeuvrable platform to lift a GoPro camera in its protective case, some FPV gear, and a really large battery for long flight times. And I want a propeller-free view for the GoPro. Is it possible to build a hexacopter that has the motors aligned in a 2x3 configuration? See the image below. Has anyone done this before? I have not seen it before. And would it be possible to fly it using the normal hexacopter mode in the KK2.0 board? you could try it with the standard hex configuration. If it seems too squirrely, you could always shorten the front and back booms and lengthen the center booms to put the props roughly in the same positions as if it were a hex-star frame. Yes, I would think the hex config on the KK2 will do fine. One thing though, I have noticed with FPV, you really want to have a somewhat down angle. . .maybe 15-25 degrees down. You have it blocked by your GoPro. So are they using a KK2.1 board? Nope, they have a KK2.2 board. You should call this "The Centipede"! If you bumped it up to 8 propellers..... wow! Wonder what that looks like after a crash.